Starbucks is to take full ownership of all its China outlets, after agreeing to buying out its joint venture partner for $1.3bn (£994m). The deal will see it acquire the 50% stake it does not already hold in 1,300 stores in Shanghai and the provinces of Jiangsu and Zhejiang. 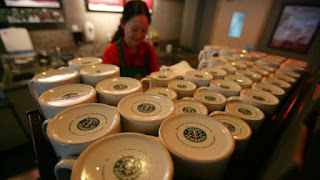 Starbucks already fully owns the other 1,500 outlets in China - its fastest-growing market outside of the US. The coffee giant said the buyout was its biggest ever acquisition. The announcement came as Seattle-based Starbucks announced net income fell 8.3% to $691.6m for the three months to July - only just matching market expectations.